Model Stacy Fernandez shares her journey of getting ready for the Rip the Runway fashion show on Friday. “This is nothing like last year. It’s not hectic, there’s no yelling, it’s weirdly calm,” said one of the girls doing hair and makeup. “Calm?” I think. Nothing about this is calm, at least not for me. Backstage isn’t what I expected. It’s not actually behind the stage, rather there is a set of stairs that leads to a room directly underneath the stage. This is where the real show is. Many of the models and event coordinators have been in the room since 1 p.m. After all, it takes time to prepare more than 30 people for a show. We can’t all be Beyoncé and just wake up like this. Makeup is sprawled across the tables and every outlet either has a phone or a hair tool plugged into it. As soon as one girl gets out of a chair, another girl is quick to appear. The makeup artists’ faces are concentrated as they erase blemishes, make eyes sparkle and lips pop. They know that in order for the models to feel the part, they have to look the part. Ten minutes before 7 p.m. and we all know that the show won’t start in time. At 7:30 p.m. the looks get finishing touches and the models line up. Right before we are supposed to go on, everybody holds hands for a quick prayer. With that, the show begins. As soon as the spotlight hits me and I hear the click of the hardwood underneath my heels, I am overwhelmed by a feeling of confidence. I strut down the runway and savor my time in the spotlight, because right now all eyes really are on me. 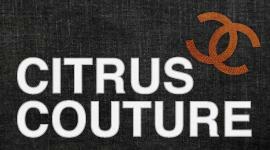 Citrus Couture is the source for everything fashion on and off campus, from fashionable co-eds to tips on trends and where to shop. Is Khloe Kardashian the new fashion powerhouse?